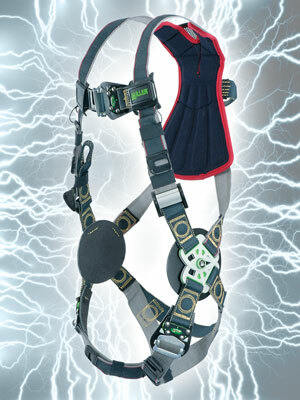 New Miller Arc-Rated Products are designed to protect workers from falls caused by electric arc-flash and arc-blast exposure when working at heights or in confined space applications near energized electrical sources. Patent-pending 10,000 lb. tensile strength webbing is engineered with permanent fire retardant (FR) properties. The webbing offers the durability and FR properties of Kevlar on the outer side, with softer FR Nomex on the inside of the webbing for greater comfort. The webbing assures arc protection and durability that eclipses any nylon webbing.